There has been a spate of "tribal" programmes on British television, programmes in which various presenters go native in different ways. From the excellent Bruce Parry in Tribe (what's it like to be a white man in a tribal community), the pecking order goes down through Tribal Wives (what's it like to be a woman in a tribal community), Medicine Men go Wild (what's it like to be a doctor in a tribal community) and the questionable Paradise or Bust (the attempt to make noble savages out of ne'er do well backpackers). Come on Shore and We Will Kill and Eat you All by Christina Thompson continues on the cross-cultural theme, but with a mix of the personal, historical and anthropological. 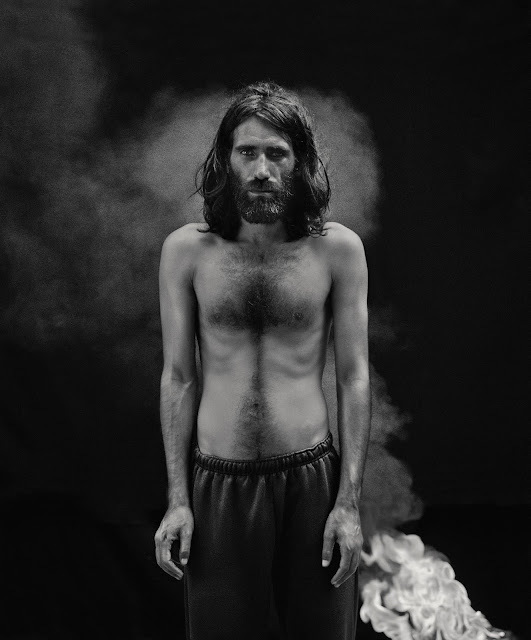 It details Thompson's marriage to Seven, a Maori man from New Zealand's North Island, but also tells the story of Maori encounters with Europeans. 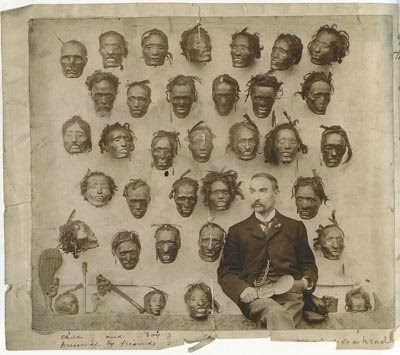 In her book she tells the story of the above picture of General Horatio Gordon Robley, a collector of Maori heads. "About half an inch to the left of Robley's right eye, which due to some trick of the camera gleamed slightly, was the empty eye socket of a preserved Maori head, a particularly striking Maori head with a toused mass of hair , borad cheekbones, and a square jaw.... Above, below and on either side were more heads ranged in rough, uneven rows: grim, black, disembodied objects with hanks of hair and greenstone ornaments hanging from their ears. Their skin was dark and shiny like leather, on some you could just make out the moko, or tattoo. " Thompson goes on to tell the story of smoked Maori heads, how, as Robley said, a smoked head used to be ""an acknowledgement of the nobility of its owner" and served to keep his memory alive. When the head of a family member was preserved, the lips were sewn together inthe middle, making an elegant shape of the mouth, like two almonds side by side." Unless the head owner was an enemy, in which case the mouth was left "unstitched... and the head was treated with a curious mixture of reverence and contempt." All this changed with the arrival of the Europeans when heads became objects of commerce rather than ritual, leading to a huge expansion in the market for smoked heads. There was a side effect to this, the heads had to come from somewhere, and soon the smoking of heads became something reserved only for slaves and enemies and was no longer an acknowledgement of reverence. And the title of the book - that's what Charles Darwin said the Maori shouted when European ships approached. He made the last bit up. What they actually shouted was Come on shore and we will kill you all. Interesting blog Colin. I haven't seen any noble savages on Vorovoro in the last two years. I guess the difference between Tribewanted and other TV series on tribes is this is a long-term eco-tourism venture. The landowners have recently asked us to extend the lease for a much longer period. We have had just over 800 responsible tourists aged 2-67 visit Vorovoro and contribute to $600,000fj injection into the local economy. The revival of traditional culture through the leadership of the local community has been recognised across Fiji as a unique and positive aspect of what the right kind of tourism can do. The Noble Savage comment was probably a bit of a cheap shot, but only at the expense of an even cheaper shot about tourist-colonialism - which would have been more accurate from some of the scenes that have appeared on the TV series. I actually loved the TV series but what happened on the island seemed very dependent on who came to the island, and who was running the projects. And there was, and is, a touch of noble savagery in some of the attitudes there, as well as much more open and idealistic notions - from yourself amongst others. I've visited a number of eco-tourism projects over the years (years that are long gone sadly), and yours made much more of an effort than most. But still, it's not really... oh, you know all the arguments, you've been through this before. In any case, I hope it's going well and wish you the best of luck with it all. Despite all the suggestions to the contrary, you came across very well and it was amazing that you actually got the thing together.